A helpful map for secret chests found in the Leviathan Raid in Destiny 2. For a long time, players were convinced there was one more secret chest to be found in the Vault of Glass Raid that was so popular with Destiny. In fact, I’m sure some still believe there is a chest that has never been found. This epic hunt is largely responsible for the Destiny 2 community and their obsession with finding secret chests, particularly in the Leviathan Raid. Well, there are secret chests in the Leviathan Raid, and a helpful individual on Reddit has created a map for them. Full credit for the creation of the Destiny 2 Leviathan Raid secret chest map goes to DestinyTheGame Subreddit user Addesso, and ScoobyDeezy, who took Addesso's 2D drawing and translated it into an isometric image. It’s incredibly clean and detailed, clearly marking chest locations for Guardians to find. 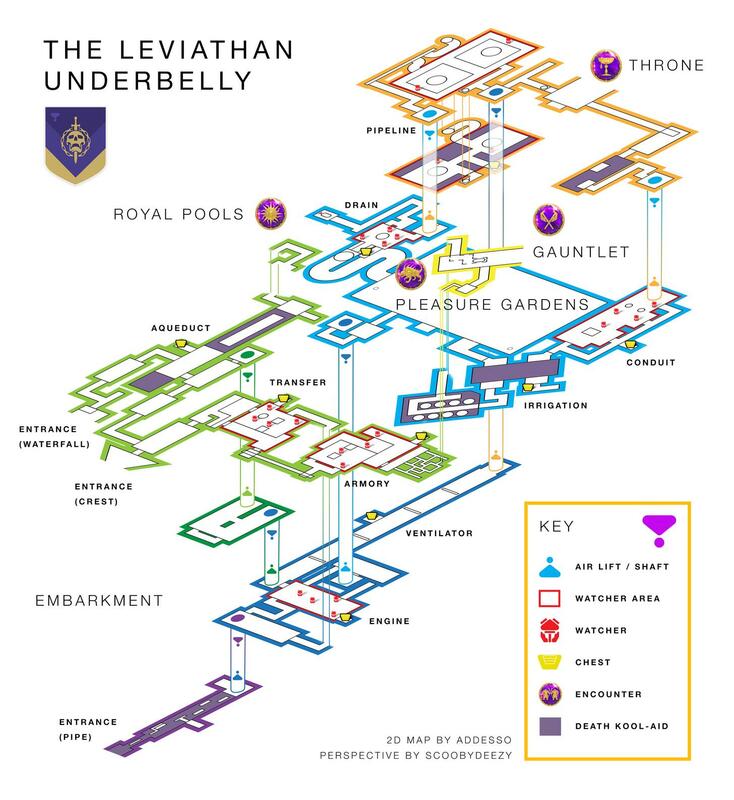 Here's the direct link to the Leviathan raid chest map in case you need to zoom in to see the paths. For those who aren’t aware, there is an underbelly section of the Leviathan Raid that features this tunnel system. The chests in this underbelly are unlocked by keys that you obtain by clearing a Raid challenge, then doing your best to navigate through this mess of tunnels and rooms. Luckily, the superb work of Addesso in creating this map will make it much easier than it would have been previously. Of course, to access this underbelly and obtain the keys that will open these chests, you’ll first have to jump into the Leviathan Raid and do some work. This will require a six-person fireteam, and it’s very likely that you’ll find yourself stuck on either enemies or mechanics at some point. That’s when you’ll want to use the Shacknews Leviathan Raid guide to help you push forward and claim those sweet rewards. Now that you’ve got this handy Leviathan Raid secret chest map in Destiny 2, head to the Shacknews Destiny 2 complete strategy guide. We’ll help you through the Raid, or help you get ready for it if you’re just not quite there yet.